Habitat LA is committed to the vision of a world where everyone has a decent place to live by bringing together communities, organizations, companies and volunteers to achieve the goal of eliminating substandard housing. The organization believes in a hand up, not a hand out with a commitment to building self-reliance through homeownership, thereby empowering low-income families and individuals with the foundation to build a better future. Donations to the Macy’s Charity Challenge will help Habitat LA in achieving their goals of Building a Greater Los Angeles. The Macy’s Shop For A Cause Charity Challenge launched on CrowdRise on July 11th at 12pm ET and runs through August 9th at 1:59:59pm ET. The charity that raises the most online during the Challenge wins $100,000; second place wins $50,000; third place wins $25,000; fourth place wins $15,000; and fifth place wins $10,000. Weekly Bonus Challenges enable charities to win up to another $100,000. Since 2006, Macy’s Shop For A Cause has partnered with accredited schools and nonprofits nationwide to raise tens of millions of dollars for their ongoing charitable efforts. 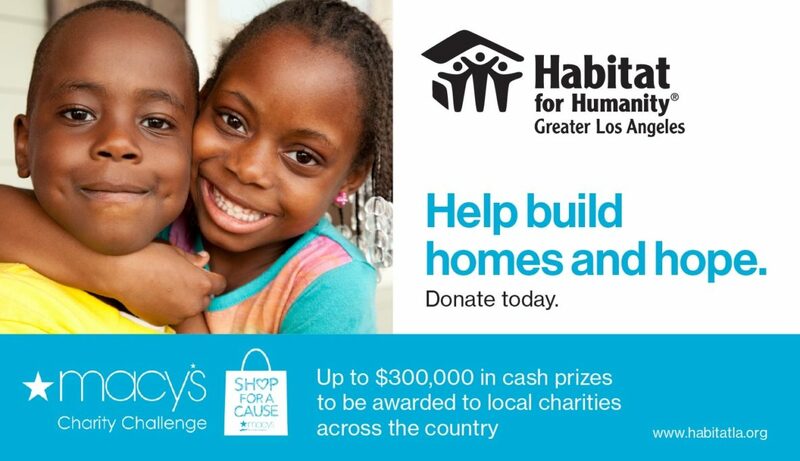 To help Habitat LA win the Macy’s Shop For A Cause Charity Challenge head to https://www.crowdrise.com/habitat-for-humanity-of-greater-los-angeles1.